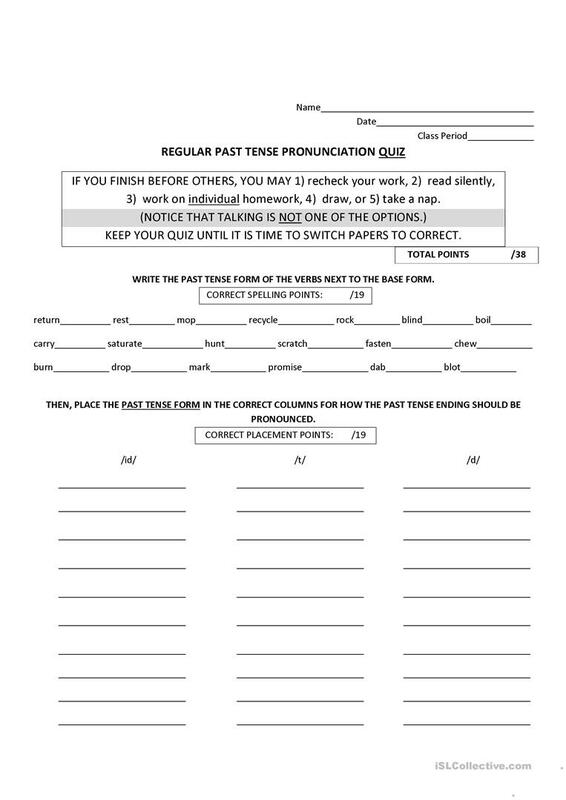 A quiz to assess students' skills in pronouncing the simple past tense (regular verbs) and in spelling the past tense correctly. This downloadable handout is recommended for high school students at Elementary (A1) and Pre-intermediate (A2) level. It is a useful material for practising Past simple tense in English, and can be used for honing your class' Spelling and Speaking skills. tericksen is from/lives in United States and has been a member of iSLCollective since 2011-11-22 23:35:49. tericksen last logged in on 2013-05-20 18:38:38, and has shared 5 resources on iSLCollective so far.